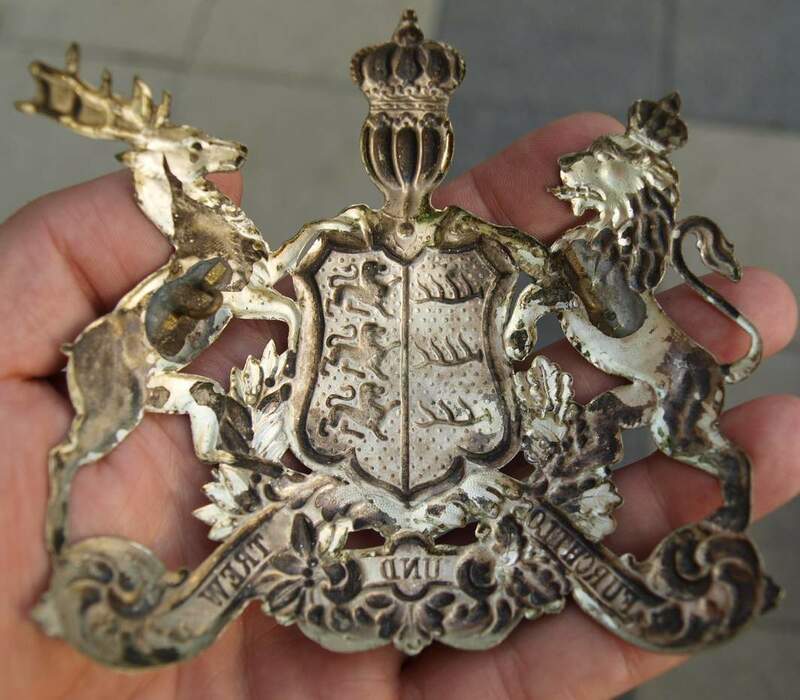 This is a recent found in a north german house. 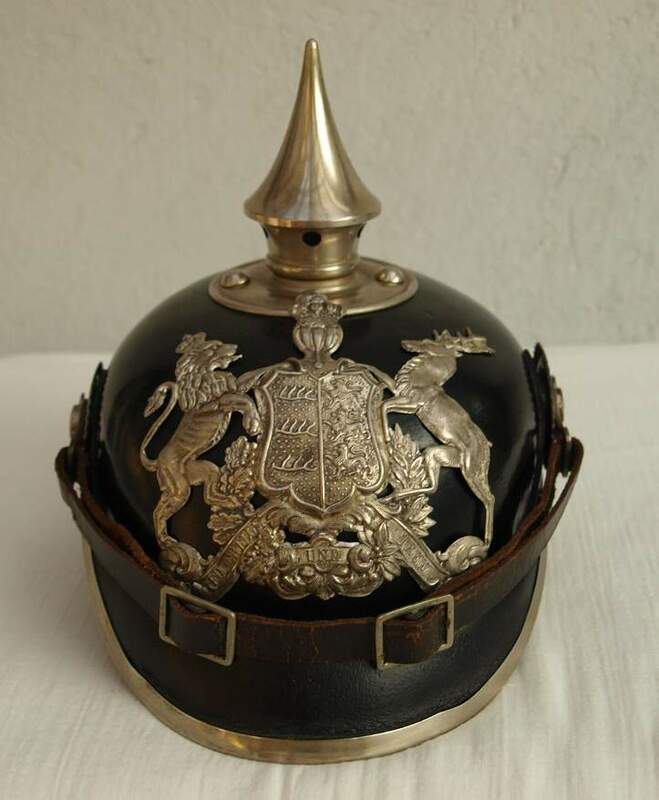 Quite uncommon to find a Württemberg helmet in this area...But the story of wearer will explain it all. 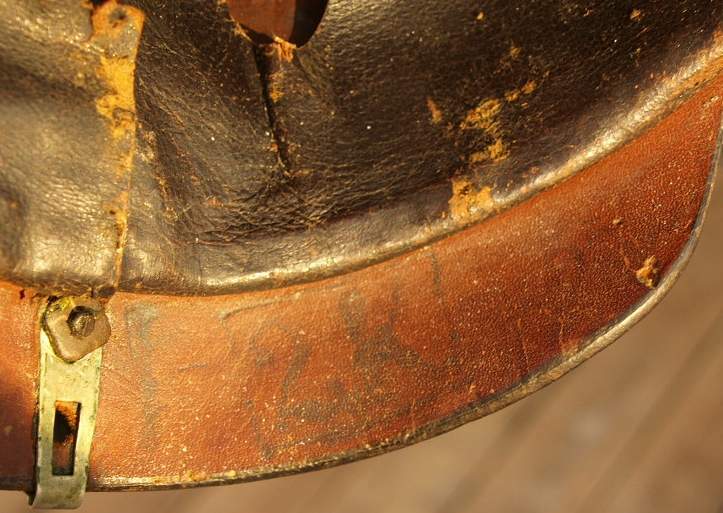 Other side of rear visor is showing the mark 2K, matching with the handwritten on the left side. The name "BRUHNS" is not a south german name but is very typical in North Germany (Hambourg, Lübeck, Schleswig-Holstein and also Mecklenburg). As the Friedens and Kriegsstammrollen from the Württemberg Kingdom were not destroyed during WWII, it was not so difficult to track this guy. Adolf BRUHNS, born on the 19.3.1889 in Rensefeld, Herzogtum Lübeck. He was electric technician before he decided to go to the army. He had no wife and no children. His father was carpenter. Adolf BRUHNS was 1,63m tall, a little corpulent. His mouth, nose and chin were unbowed. Hair was blond and Adolf wore a moustache. The size of his boots was 29/4. 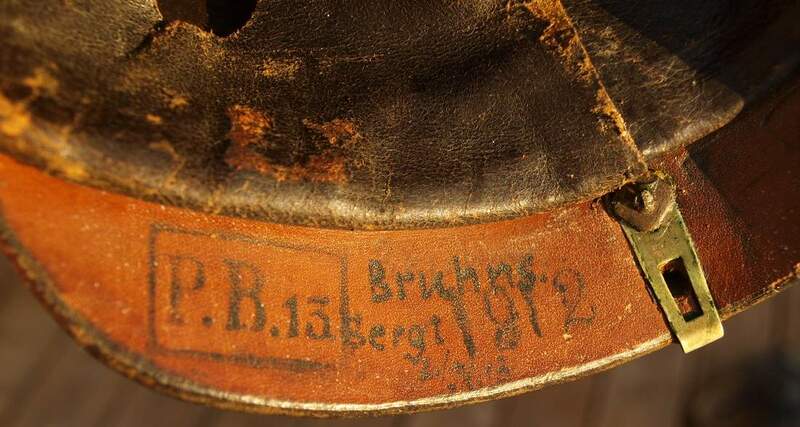 On the 1.10.1912, he moved finally as a Kapitulant (Feldwebel formation) to the 2 Company of the Württemberg PB13 and was promoted to Sergeant on the 7.4.1914. This was the moment he marked his helmet. In the year 1913, he had to stay a few time in a Lazarett because of eczema. Adolf BRUHNS was familiar with the Gewehr 88 and 98 training as with the Feldtelegraph, the heliograph and the communication through light and banner signals (Winker). He was able to ride a bicycle and to swimm. He also was "Festungspionier" (Fortress-pioneer). Here are his results of his kapitulant exam, just before the war as the latest Kapitulant of the PB13 (in German language, mathematics, geography and history). He fought at Bleid, Barancy, Tellencourt and Petit-Failly between the 22 and the 25.8.1914. On the 27.8.14, he was sent to a Lazarett because of pain in his legs and feet. After the hospital, he moved to the 3 Ersatz-Kompanie and later on the 10.3.15 to the 5 Ersatz-Kompanie of the Ersatz Bataillon of the PB13. On the 1.9.1915, he comes to the frontline again in the 2/PB13. Adolf BRUHNS is now Feldwebel and the PB13 is now fighting in the Argonne forest. 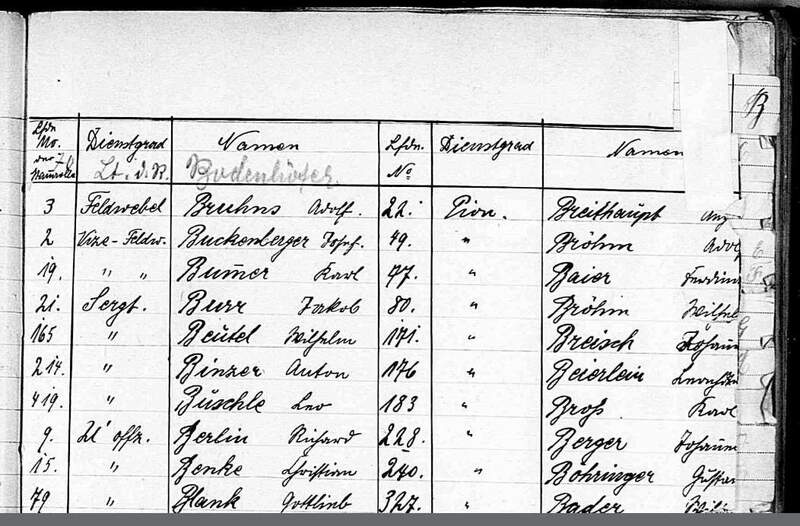 On the 6.1.1916, the 2/PB13 was sent to Flandern near Tenbrielen.. But Adolf BRUHNS is sick again. He caught a very bad infection, a chronical catarrh (gastroenteritis) in the Argonne forest. On the 7.1.1916, it was officially decided that he is front unable. On the 28.6.1916, he was then sent to the Ersatz Bataillon of PB13 in Ulm till the end of the war. He may have helped there by the formation of new recruits. Great job and super nice helmet. Excellent job on the article. A great addition to your collection. 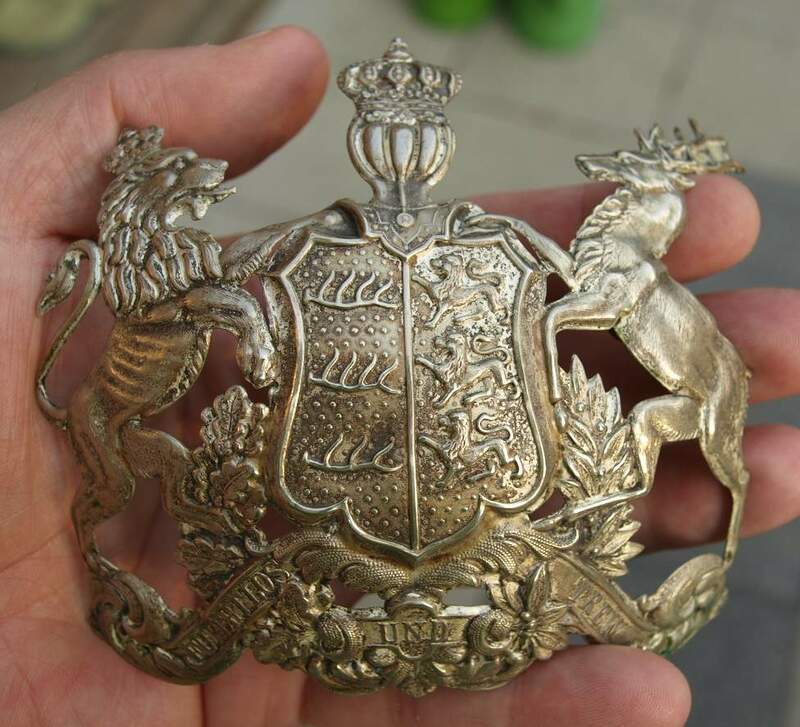 Its a great representation of why we collect. Beautiful helmet and a beautiful story! 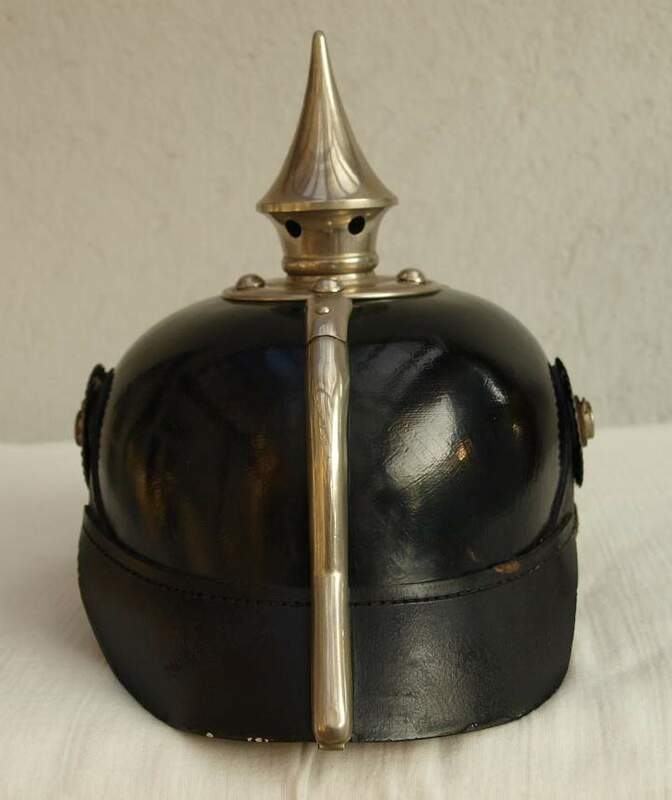 Very nice pickelhaube and also super research! Very well done sir!!! Great helmet and to be able to follow his career is wonderful. But (long pause) --- wouldn't he acquired a better helmet, befitting his grade on becoming a senior NCO? 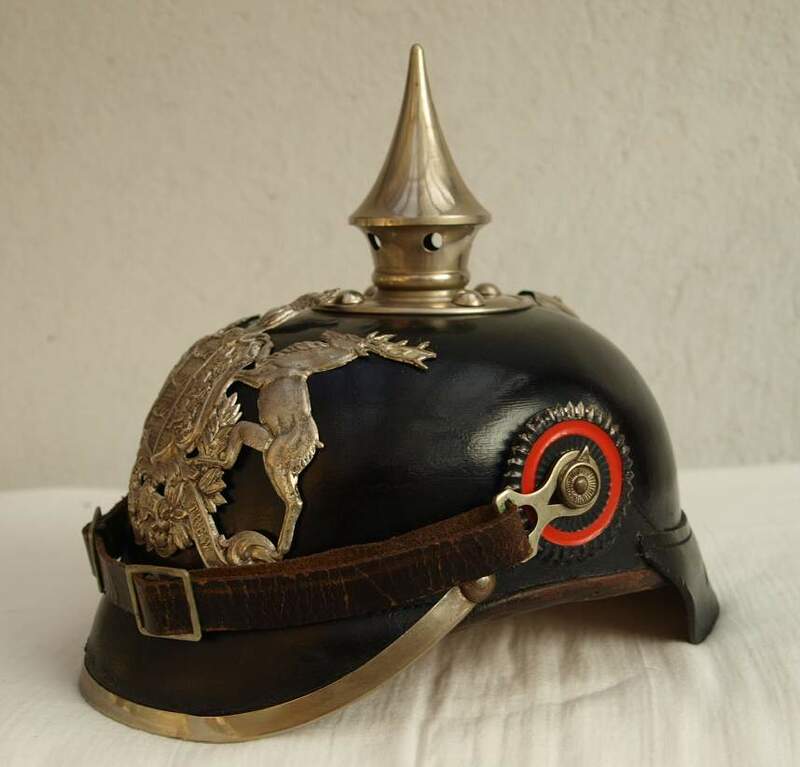 Or at least placed NCO cockades on this helmet? Maybe, he retained his helmet as a fatigue piece and had a better one for formal duties. If so where is the other helmet? that I still had it .It is around somewhere. A real good one for you! But (long pause) --- wouldn't he acquired a better helmet, befitting his grade on becoming a senior NCO? 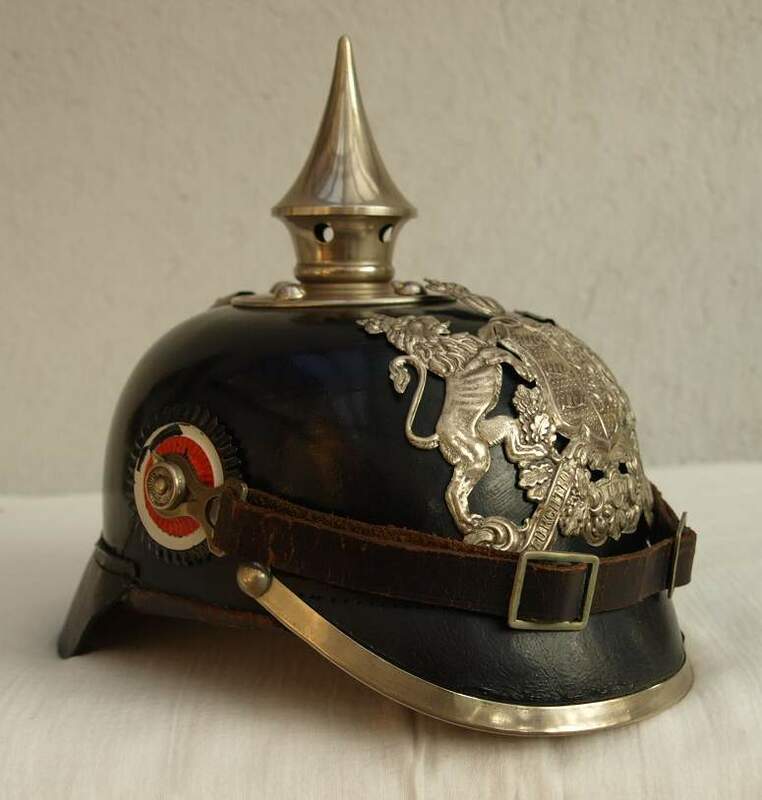 Or at least placed NCO cockades on this helmet? 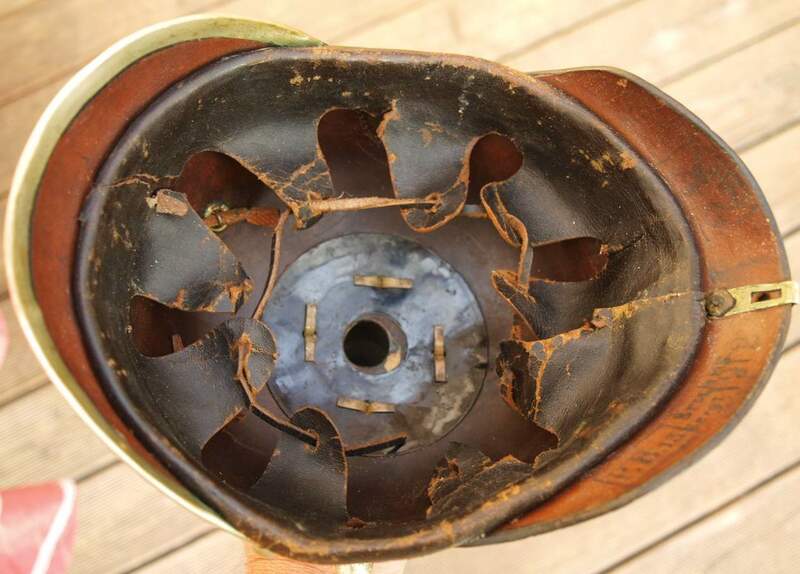 Maybe, he retained his helmet as a fatigue piece and had a better one for formal duties. If so where is the other helmet? Great helmet with an excellent story! 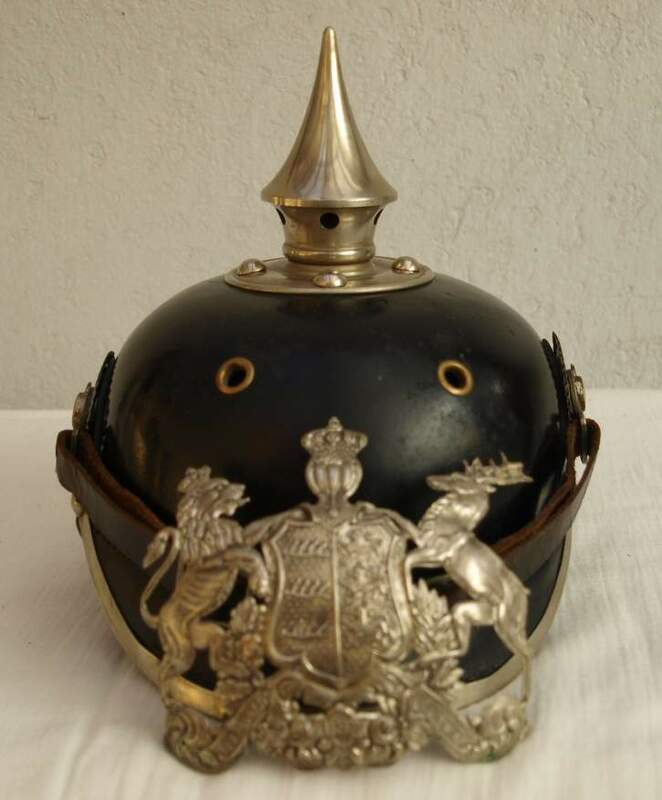 Great helmet with an impressive history. Wow! Super helmet and super story / research! A fabulous helmet & fantastic research work Philippe, congratulations!